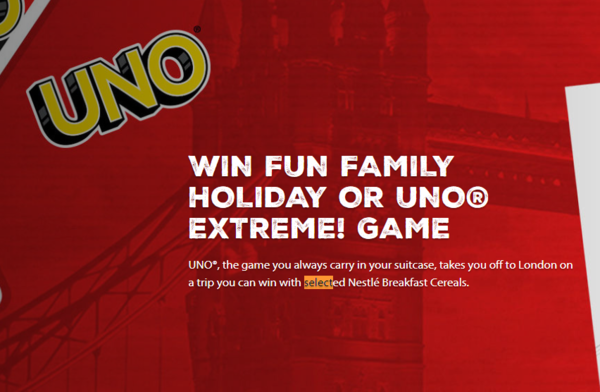 UNO®, the game you always carry in your suitcase, takes you off to London on a trip you can win with selected Nestlé Breakfast Cereals. Find the 12 digits secret code in Nestle Cereal boxes. Fill in the code here to participate. Main prizes (trips): One  winner will win a family trip for 2 adults and 2 children per trip to London. Secondary prizes: (UNO rewards) Eight hundred and eighty-eight  winners will each win a UNO Attack or a UNO Stacko set.